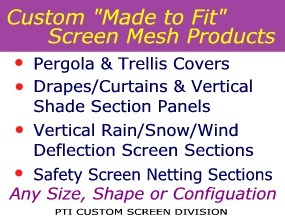 Choosing the right screen mesh for your pergola, trellis, porch, patio, lanai, windows, glass doors, and other screening applications will insure success of your endeavor. Each project requires consideration of the results expected from the screen material (purpose). In addition, many types of projects often require specific screen properties for the desired results to occur. In this article we will attempt to assist you in your selection of screen material by providing examples of typical projects and the screen product best suited for that purpose. On hot sun filled days, you can block the heat and lower temperatures by 20 degrees or more if you use an open weave screen of about 80% density mounted overhead. The open weave is necessary to allow the hot air to rise and escape. The 80% shade screen will cool the deck or ground below and the resulting cooler air will flow upward to fill the void left by the escaping hot air (natural air-conditioning). By selecting the proper screen density for the desired outcome, you can enjoy "outside living" in fresh air and still have shielding from heat, wind, rain, snow, damaging radiation from the sun, sunlight glare and can even have privacy. Shade screen is commonly available in two basic densities. They are: 80% and 90% with each one often serving similar, yet sometimes, very different purposes. Both densities will shade and protect from all the unwanted elements (including insects). However, when it comes to rain deflection or preventing sunlight glare or providing high privacy, the 90% is the preferred density. An 80% dense shade screen allows higher breeze flow. Due to this, it is often desirable to use it on locations that don't require shielding from direct sunlight glare or maximum rain deflection or high privacy. For more information on vertical mounting, be sure to read our support article relating to drapes and curtains. If privacy is an issue, our support article on privacy from shade screen will give more details. Barrier Screen Safety Netting for Porch, Balcony, Stairwell, etc. Hazardous safety railings can be made safer for pets and small children with the usage of ultra-high strength screen mesh. A screen density of 50% to 60% with a tensile strength of 150 lb or greater is ideal. Screen materials with very open weave are nearly unnoticeable when attached to a railing. However, if you are on a balcony and desire privacy from those looking up at you, consider using a shade screen material instead. 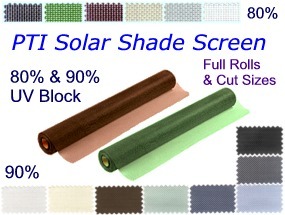 All shade screen with 80% or greater density has high tensile strength. Since you are relatively close to the screen, you will see out quite well. Whereas, those viewing from below (due to their distance away) will find seeing in very difficult. Cooling Your Home and Saving Energy. If you want to stay cool and "keep the view" too, a very fine weave (90% density) solar shade screen mounted over windows and glass doors (either inside or out) will do the trick. Energy savings is not the only added benefit. Sunlight glare is greatly reduced and privacy from the outside is inherent. By selecting an eye pleasing shade screen color, the screen can either blend with or add accent to your décor. 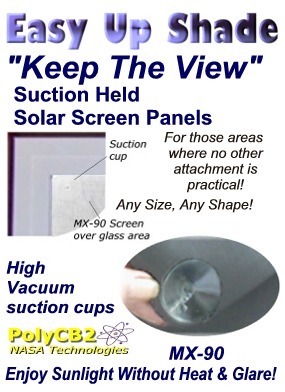 Stop Reflected Solar Radiation Damage. Solar Energy Diffusion (SED) screen defuses by diffraction the high energy beams of sunlight created by reflection from window panes. This redistribution of a potentially concentrated beam, dissipates the solar energy over a wider area rendering it harmless. If you are experiencing the phenomena of melted vinyl siding, burned out sections and strips of grass lawn, destroyed outdoor furniture or other extreme heat damages, this screen installed over the offending windows will solve the problem.